Details relating to the Finnish Commemorative of 2011. This coin commemorates the 200th anniversary of the founding of the Finnish national bank in 1811. The image in the inner circle depicts the whooper swan which, due to its importance in Finnish mythology, is the national bird of Finland. The wing separates the two dates 1811 (four o’clock) and 2011 (nine o’clock). At the bottom (six o’clock) the mint mark, a lion within a circle can be seen and directly under the wing tip (seven o’clock) FI for Finland. 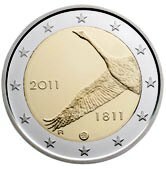 Note – the whooper swan in flight can also be seen on the standard Finnish € 1 coin. Return from Finnish Commemorative 2011 to euro coin collector.